At first, on an area of only 50 square meters, 5 people, all Hutton family members, from two generations, manually produced about 20-25kg of noodles every day in 3 different forms, specific to the area: diamonds, leafs and tagliatelle (noodles / laste / laska). Their marketing was mainly made in the chain of “Alimentara” shops, the only shops of that time. There are about the first requests for "wedding" noodles: noodles in the form of diamonds added to the chicken soup. These, made according to traditional methods, contain everything that is best in a dough: quality flour and fresh eggs, as many as possible; no water added. You just do not want to put your guests on the table ... Once the children's wedding! And so it is their name: "Wedding Noodles" TM. Gradually, in the years to come, with the desire to ease work and increase productivity, it manufactures various handheld devices, and then acquires a mixer, a dough rolling machine, a dryer, and then a new Italian press for dough,. By the end of the 90s, when due to the growing demands from customers, the production reached about 1000 kg per day, the need to move to another level was required. The space available in the courtyard of the parent's home was not enough. Counting everything on a single book, with great financial effort for that time, opts for the acquisition of a land on the outskirts of Satu Mare and the beginning of the construction of a modern, modern hall. In 2003, production began in the new factory. It was an important leap: with the new line, of Italian origin, the production capacity increasing to 3500 kg per day. 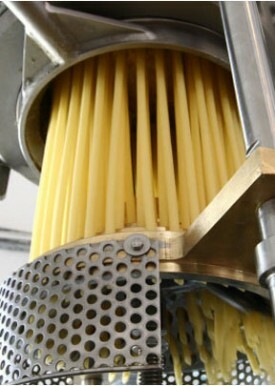 Product diversification began, with various short pasta models such as cus-cus, snails, tubes, spirals, and then medium-sized pastas such as noodles. The growing demand from the Satu Mare market and gradually from the adiacent areas too, has led to the need to acquire new machinery to increase production capacity again. Thus, in 2006, as a result of new investments in machinery, production and storage facilities, the capacity was tripled. During the period 2006-2012, partnerships with various distribution companies in Transylvania started, reaching a total of 15 counties. Gradually, initially at local and regional level, Hutton products appeared on the shelves of national and international network stores. Recently, as a result of Hutton pasta customers' demands, as well as the market trends in long pasta, especially spaghetti, a new production hall was built and a new generation production line was purchased Italian. (All this was possible by using European funds, own funds and bank loans). Nowadays, due to the constant quality, seriousness and promptness, the respect of the commitments and, above all, thanks to the passion for the well-done work, we have become the largest producer of pasta in Transylvania (with Romanian capital in full) and among the top 10 from Romania. ... and the story goes on!